Sorry to hear that broadcaster Paul Holmes has passed away. Knew him in the 1980's when he worked his way as a freelancer through Europe, doing all sorts of crazy things to see the world. Worked at Radio Netherlands for a while (covering the Paralympics) as well as at Blue Danube Radio and Swansea Sound. Then he returned to his native New Zealand and became a TV star and personality. Larger than life character. Added a little spice in the world and really woke up presentation styles on commercial radio. 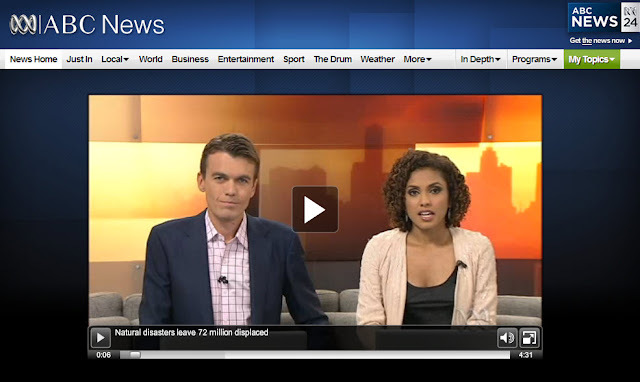 Thanks to Bryan Clark in Auckland for passing on the news. He was a faithful contributor to Media Network in the latter part of the show's history. UPDATE: The end of January is an important anniversary. 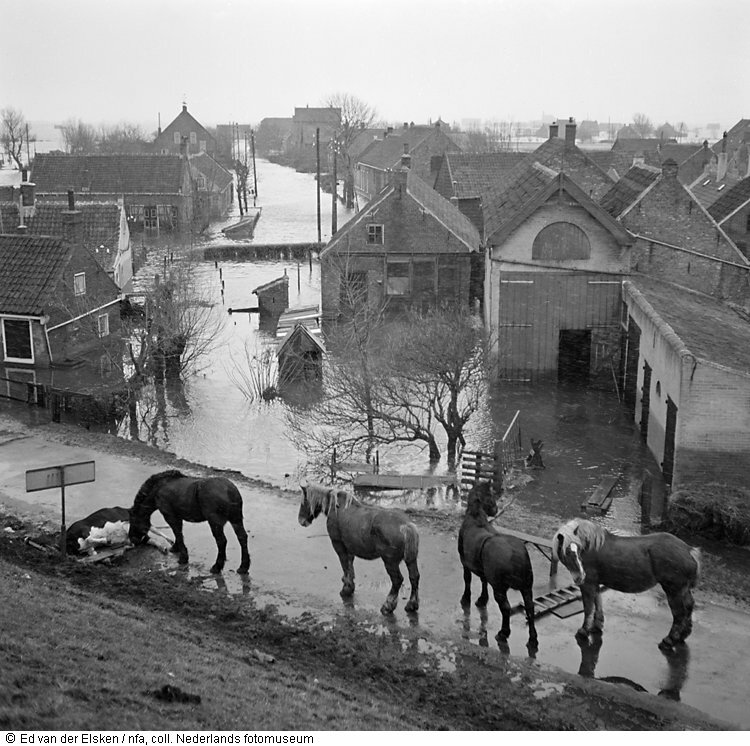 It is 60 years since devastating floods hit the Netherlands and the East Coast of the UK. I'm hearing all kinds of tributes on local media and BBC's Radio 4 Today programme. Time to repost something I wrote a few months back, because when it comes to warning people of flooding, I don't think we're prepared at all. There's also a radio documentary below about the flooding, made 20 years ago about the 1953 floods. 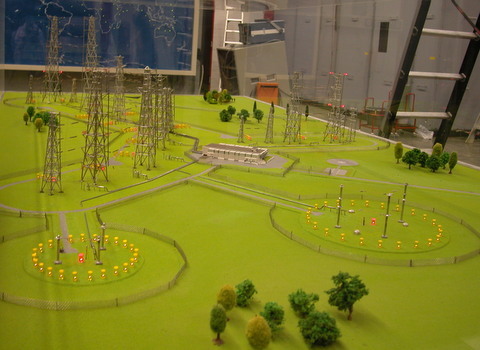 Above is an artist's impression supplied by the Dutch engineering firm of Arcadis. 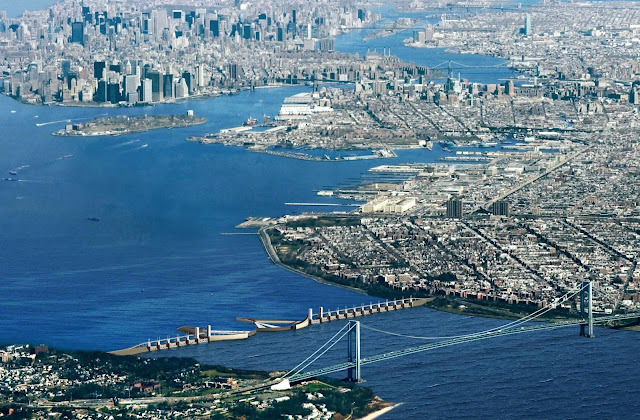 They are proposing to build a barrier in the Verrazano Narrows between New York's Brooklyn borough and Staten Island, shielding the Upper New York Bay. 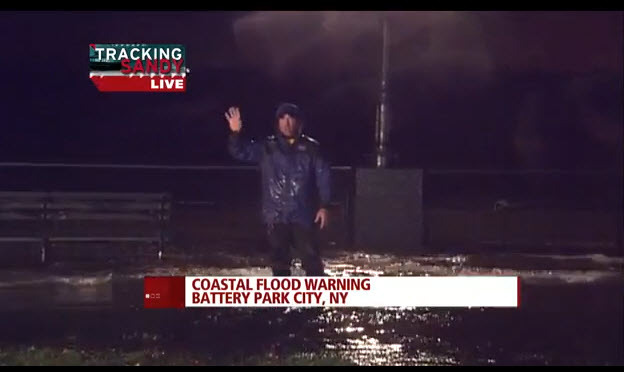 This barrier would be supplemented by two smaller barriers, one between Staten Island and New Jersey and the other on the East River. 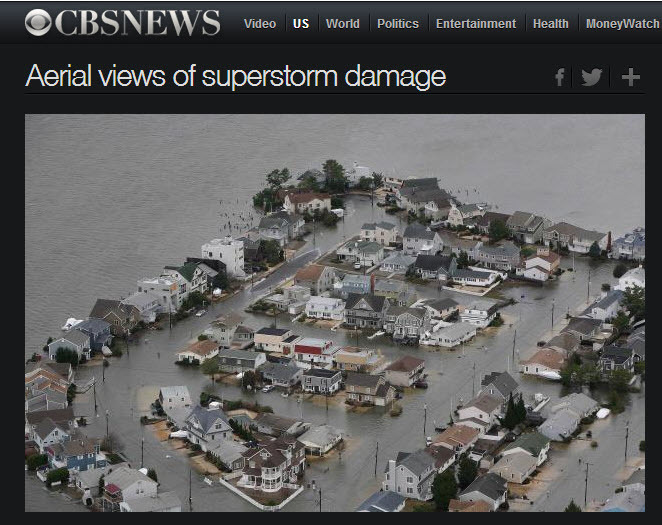 Much of the vast destruction wreaked by the storm surge in New York this past week with Superstorm Sandy could have been prevented or reduced with a sea barrier of the type that protects major cities in Europe. But of course it comes with a multi-billion dollar price tag. How do we know? Because Holland was flooded in 1953 and one of the lessons learned was that storm surge barriers were needed to protect against very high tides. Most people I meet don't realise there are several of these barriers. This was the most expensive to build. The nine kilometre-long Oosterscheldekering (kering means barrier) which was initially designed, and partly built, as a closed dam. But after public protest (especially from the fishing industry) huge sluice-gate-type doors were installed in the remaining four kilometres. These doors are normally open, but can be closed under adverse weather conditions. In this way the salt water marine life behind the dam is preserved and fishing can continue, while the land behind the dam is safe from the water. But this type of construction doesn't allow ships to pass. So for New York (and other large cities near the sea like Rio, Tokyo etc), a different design would be needed. Coordinates: 51°57′18.98″N 4°09′49.63″Ewhich automatically closes when needed. It is part of the Delta Works and it is one of largest moving structures on Earth. (info from Wikipedia). Amongst others, The New York Observer wrote about that this week. The costs are obviously astronomical. It was US$4 billion to build the sea gate in the Netherlands, known as Maeslantkering, or the Maelstrom Barrier, when was completed in 1997. While "twice the size of the Eiffel Tower" sounds big, the Verrazano Narrows is more than three times as wide as the Rhine span for the barrier in the Netherlands, and that's before the two other gates are constructed. The cost could easily surpass $10 billion, likely making this kind of damming gates the most expensive infrastructure project ever undertaken in the USA. This is not simply a Dutch tradition. Following the same North Sea Floods of 1953, the British built a flood barrier in the Thames. It did not open until 1984, at a cost of £534 million, which would be £1.4 billion today, or $2.25 billion. Frankly, there are still some gaps. I made a radio documentary for Radio Netherlands in 1993 looking back at the floods in the Netherlands in the winter of 1953 and what had happened since. It contains many broadcast extracts from broadcasters that used the radio station's facilities to broadcast to the US. UK listeners may recognise the voice of Brian Matthew who worked for Radio Netherlands in the 1950's and then went on to a career at BBC Radio 2. It's on line (for free) if you want to listen again. Or you can click the player below. Not playing? Check out the episode here! But listening to that radio documentary again this week, there was a point which struck me which neither the US or the Netherlands have yet tackled. One of the problems in 1953 was that Dutch villages had few phones, so no-one knew about the pending disaster. How do you communicate information before, during and after such a terrible natural disaster? 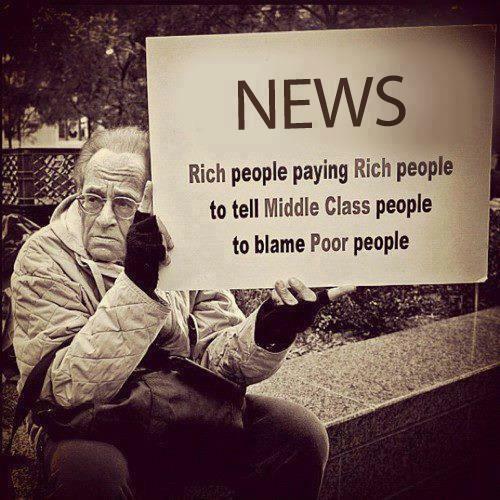 Media tend to fall into the trap of just reporting it - we see the usual reporters out in the wind. This doesn't convey much useful information, often sending out a false message of security. ("It can't be that bad if they're out with a camera crew"). Where the media totally fails is providing an accurate overview of what happened. The Dutch have spent billions on building infrastructure. But virtually nothing on a cross-media communications plan should huge storms or disasters come this way. 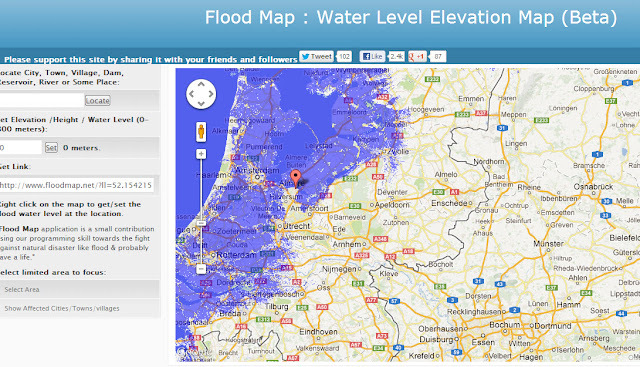 And remember that flooding may well come from rivers in Germany rather than the North Sea. In that respect, I think the Australians and New Zealanders are way ahead of us. 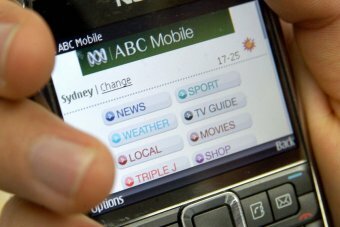 Take the example of the Australian Broadcasting Corporation working with emergency services as well as Google Maps to provide up to date maps of what's still working - where can I charge my phone? Where is the safe drinking water? Which shelters are open and how do I get there? Which transport services are still running? All this means the use of maps, not announcers reading out lists. 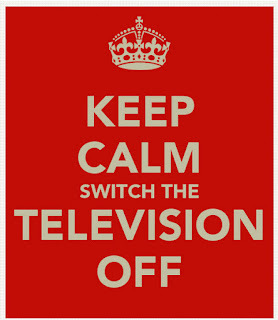 It also requires the kind of local detail which demand something better than a "broadcast TV" solution. I'm guessing it's going to be a hybrid solution - a mix of broadcast, mobile and web. And, especially in coastal areas or places where flooding is likely, those services need to be equally reliable. I note in New York that the broadcast services were less affected than the cell towers and Internet providers. 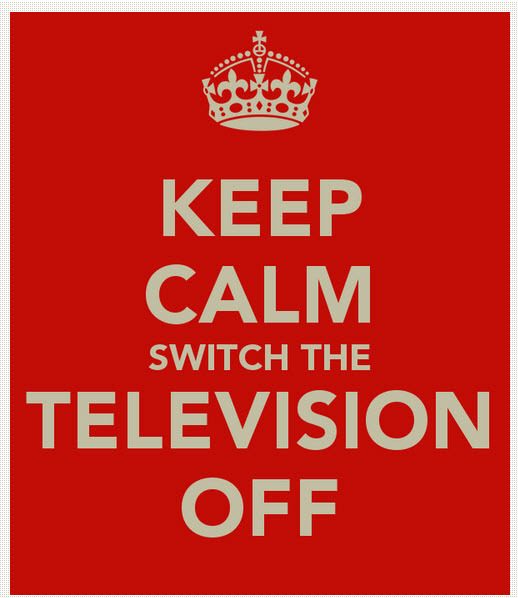 But those who argue that we should go back to relying more on broadcast networks ignore the fact that many people no-longer get their information from over the air broadcast networks - or if they do, that content is being delivered over IP technology to tablets, phones, etc. I encourage others to look into the work of US writer John Robb who has written a lot about the threats we face - and what we can do about it. His latest project is called Resilient Communities and offers practical advice on what you can do both prepare and recover. He also summarised the impact of the storm - the tides were higher than predicted - thank goodness there was actually less rain. I liked the recent post on power for instance. John made me realize that my energy provider in the Netherlands doesn't map anything. Their page of outages is a long list of problems. If this were an emergency I would be interested in a map showing where power were still available - exactly the opposite. Likewise, the water company focuses on what's not working, rather than mapping what supplies are safe. I signed up for John's new project which develops Resilient Strategies and publishes them. Much better value than I have seen from the commercial press. I also like the unofficial Google Maps blog called MapsMania showing what others have done to make intelligent maps. 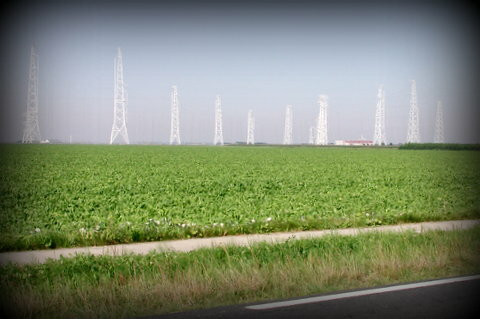 In the Netherlands, the public network Radio 1 is designated as the network to go for information in case of a natural disaster. And one of the 13 provincial radio stations is the place to go if the emergency is regional. Dutch Government websites are poor in explaining. There is nothing in English on their websites for visitors staying in the Netherlands or people who work for international companies but who don't understand Dutch. The Dutch language website refer people to a frequency list (wow!) and a report of a congress in 2002. 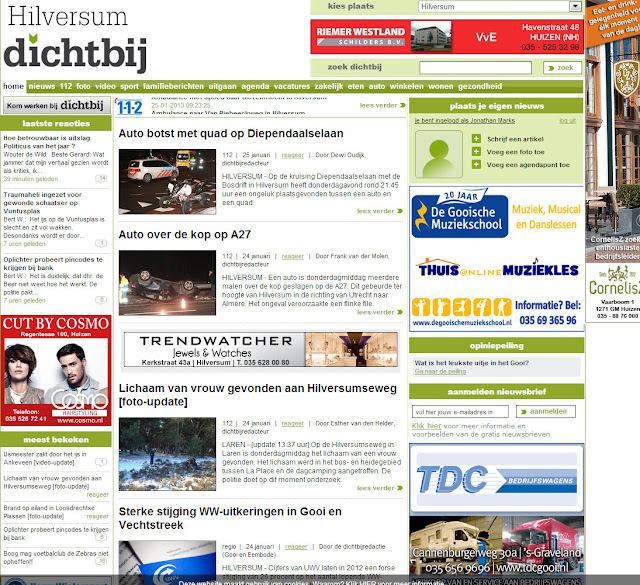 There is a website in Dutch called Crisis.NL. But, unlike sites elsewhere in the world that use such a site to help you prepare, this site is closed until it's needed. There is a link to another site with tips, but it points out that most of it is in Dutch. Can you read this on a mobile? With difficulty. We have some brilliant water barriers. And the best water engineers in the universe. But, in the Netherlands, we don't have a public communications plan. We have websites with PDF brochures. Few know they are there. And they are not easily accessible for non Dutch speakers. And that scares the hell out of me. Doing something like this to correct the problem in your own community? Would be interested to find out more. I recall the great work done in New Zealand by volunteers at community radio stations following their earthquake. Belgian Rudy de Waele has a refreshing view on what's next for smart mobile. He started Mobile Monday in Barcelona. Now lives in London. Have huge respect for the Dutch startup Booking.com, who's HQ has now moved into a an old bank near Rembrandt Square in Amsterdam. Great company, now with a world-class ad, made in the Netherlands by Wieden+ Kennedy Amsterdam. Why does it work? Because the story is so authentic and powerful. We've all been there. The style reminds me of the "commercials" Jim Cutler used to read for me in Media Network. Trust in the media is worryingly low these days. Is this really what's going on? I don't normally read Variety magazine. But thanks to a couple of experimental newsfilters I am experimenting with, as I was looking for articles about the BBC and trust, it came up with this article. One passage really struck me. 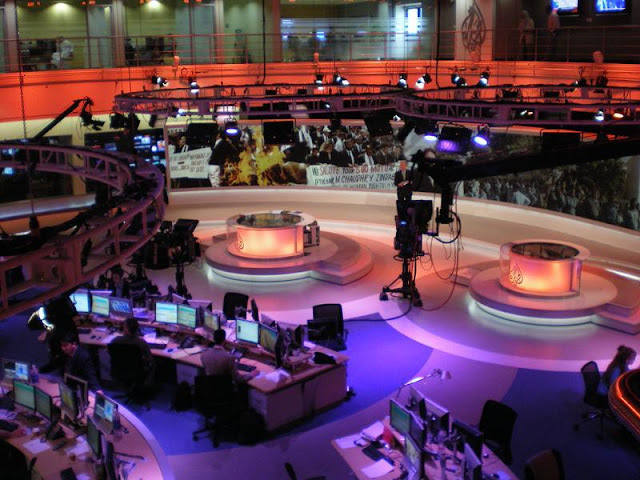 In an increasingly competitive environment, as rivals like Al Jazeera English prepare to enter the U.S., where BBC World News struggles to find distribution, it is more prosaic factors like audience figures that will determine whether the channel's performance matches the ambition of its new HQ. "I always say that we aim to deliver the three Rs -- reach, revenue and reputation, of which the most important is reputation," said Jim Egan, COO at BBC Global News. "There's a gap for trusted, impartial news that is truly global in its reach," added Richard Porter, controller, English, BBC Global News. Balancing those three R factors is extremely difficult at the moment. 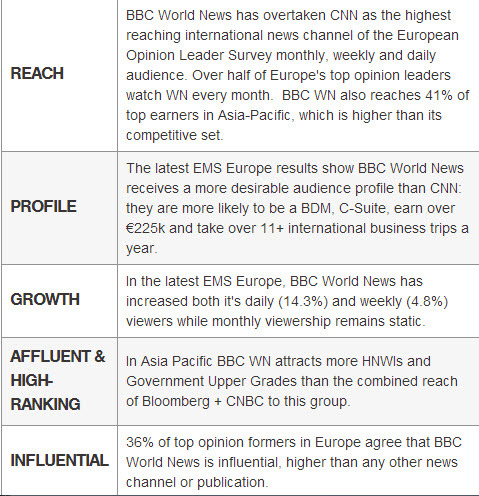 International broadcasters like BBC World News operate in the niches of the broadcast world - most people get their news from national broadcasters. International distribution is expensive and complicated. Stakeholders are often unrealistic in understanding the difference between reach and influence. It's about the quality of eyeballs, not just the number. I'm getting even more concerned about reputation, especially as I see the PR world is moving closer and closer to new forms of advertorials. In an article, which also turned up in my list, was a blogpost from Richard Edelman, entitled Paid Media a Change of Heart.This passage caught my eye. Those of us in PR have to change the game. Let’s recognize that the digital platform for mainstream and hybrid media is an unmatched opportunity to offer hundreds of visual images, a different mentality about contributing comments, a high propensity to share quality material and a short-form mode for absorption of information. Why not take on the chance to make content the basis of advertising? Ads are inherently more effective when you have something to say. 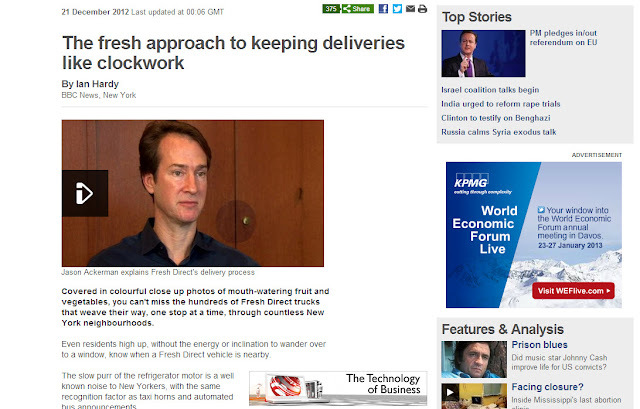 And we are better than any other marketing services sector at knowing what is newsworthy at any moment in time. We are already putting this thinking into action. We helped establish a partnership between Samsung and the Associated Press that was announced today. The AP will grant Samsung two tweeting slots a day on the AP’s own Twitter account for the five days of the Consumer Electronics Show. This is the first time AP has sold space on its feed; the tweets will be labeled SPONSORED and will not be done by AP staff. 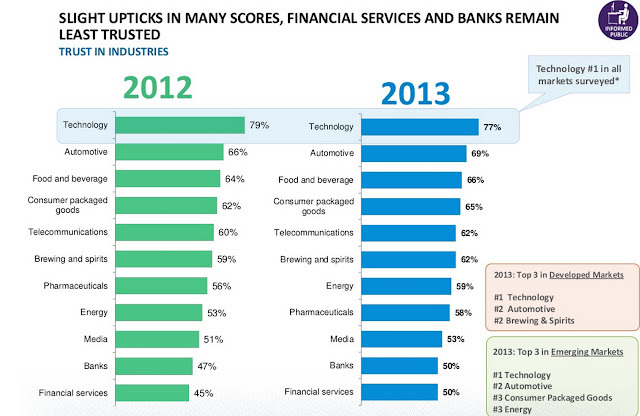 Edelman also published the results of its annual Trust barometer. The bit about trust in the media also caught my attention (my emphasis). Slide 13 in the deck above. Among the general population, mainstream media and online search (both at 58 percent) are the most trusted sources of information. More than half in emerging markets trust all forms of media while developed markets have a high variance in trust levels across the various media types. When looking at social media, emerging markets (58 percent) are more than twice as trusting as developed (26 percent). 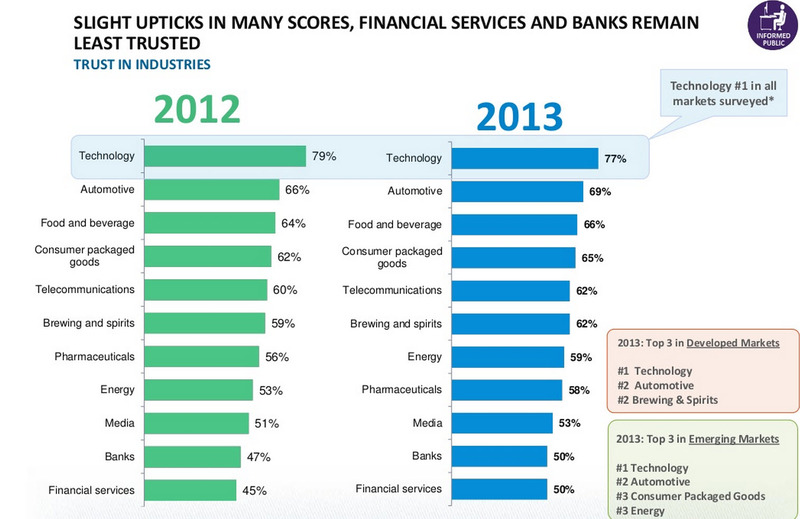 Media is way down there only slightly ahead of banks and financial services. 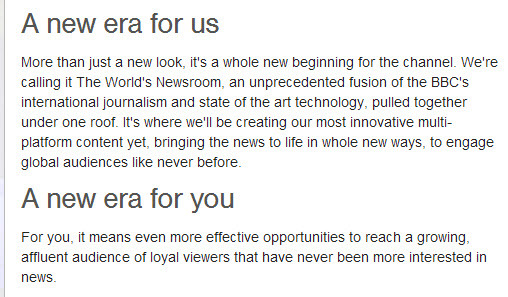 So do we trust Apple and Vodafone more than a BBC World News? The bit about the profile intrigued me. 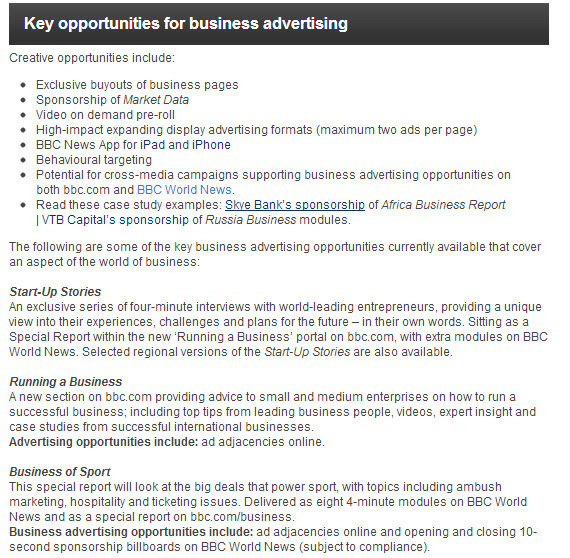 So I accepted the invitation to explore a section of the site called BBC Advertising. I love the spin in the section about advertising luxury goods and the trust tests they have been doing with Merryl Lynch way back in 2010. Some fascinating claims come out of this part. So what's the point Jonathan? As a BBC World News viewer, I don't mind if the channel carries advertising. But I do care when I can't tell what is a "sponsored story" , promoted up the attention chain rather like Google does with Adwords. The next bit disturbs me. I find the use of the word exclusive by the BBC to be intensely irritating. 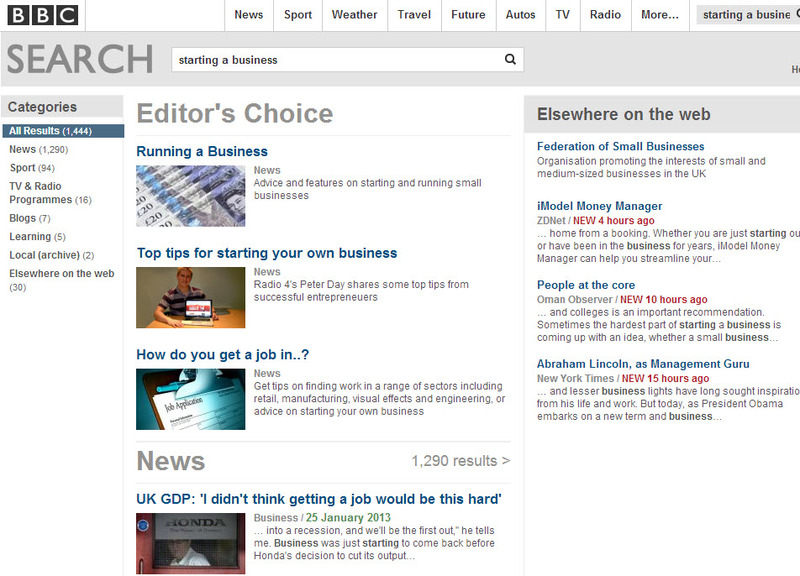 Because the BBC doesn't have the monopoly on interviewing entrepreneurs. It would take a lot more than a 4 minute interview to persuade me to invest. Do I trust the BBC to do due diligence on the companies they decide to feature? No. Because when I search for the term "Starting a business" I see the advertising opportunity described above right at the top of the Editor's Choice. I am immediately suspicious because its higher in the ranking than Peter Day's top tips which I trust implicitly - his world of business programme is a must listen. Running a business instantly disappoints. It's a random collection of profiles from soup to nuts. And the text in some of the profiles reads straight out of a publicists media release. Running a Business seems to be nothing but rather bland profiles. Advertising on branded channels like BBC Autos or BBC Travel is fine by me. I treat what I see rather like the tweet from Samsung or the holiday recommendations to visit country X and spend money. All with a healthy dose of scepticism. 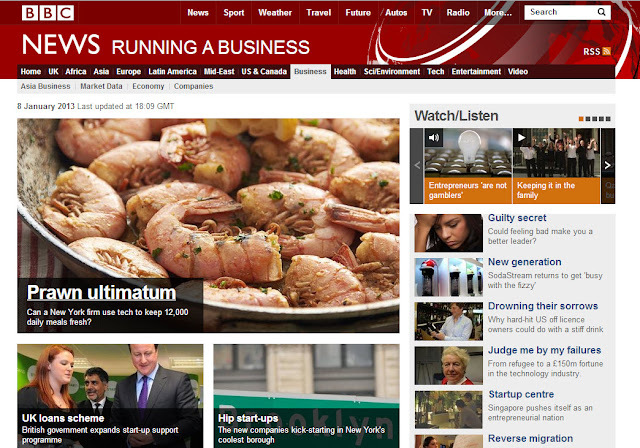 My problem is with BBC World News. From what I have read about advertising opportunities, I have no idea if my attention is being manipulated so I watch or read something that has been promoted by a sponsor. Am I reading a piece of investigative journalism from which I might learn something new? Or is this a puff piece being partially sponsored by the banner ad from KPMG who wants to brief me on their interpretation of the World Economic Forum? I don't see any advertorial banners, but I'm very distrustful because no-one seems to be explaining where the editorial boundaries lie. With trust being so low in financial institutions and banks, I think the reputation of the BBC World News channel suffers from its adventures into "special "and "exclusive" features. It may bring in some short term cash, but what's the cost to its long-term reputation? Personally, I start to look for other sources. What do you think? 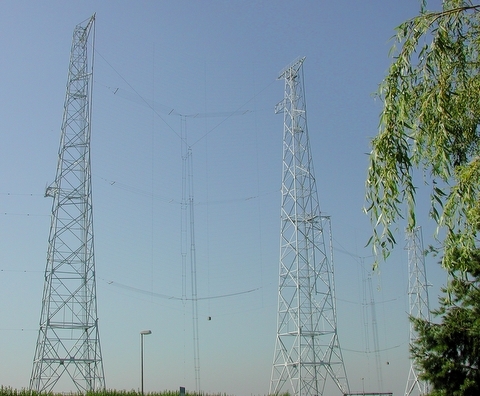 Kim Andrew Elliott advises that a special short-term amateur radio station with the callsign PH00ZWAT is active today and tomorrow from the former Radio Nederland Wereldomroep antenna park near the town of Zeewolde. They are using extremely low power (nothing like the 500 kW that was used for broadcasting. I guess more like a single kW). But that gets an enormous boost when the antenna outside is 120 metres high. There have been several event like this. The first was in February 1985 when I organised the special event station PA6FLD. Just found the radio programme we made announcing the fact. 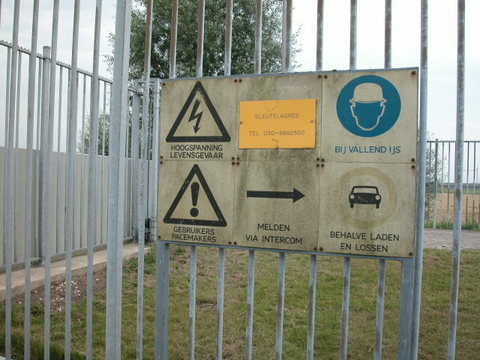 We "misused" the new Flevoland shortwave transmitter site by connecting ham radio gear to the giant short wave antennas outside the building in Zeewolde. This year, 2013, the same thing is happening on 26/27th January. But this time the short wave broadcast transmitters are no longer active. Check out this episode! At first there were rumours that this shortwave site that carried programmes of Radio Netherlands was going to be dismantled. On October 16th 2012 everything was officially sold to the Netherlands Ministry of Defence for an undisclosed sum. 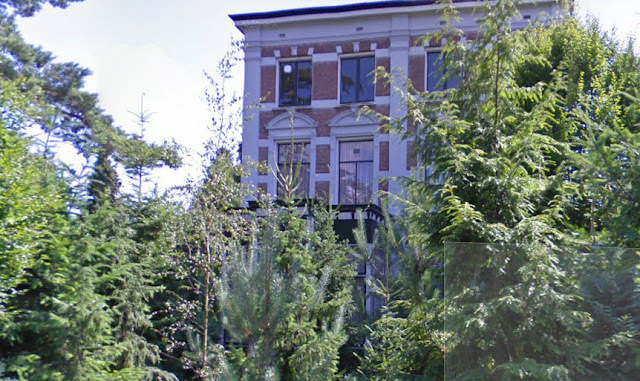 Flevo is being turned into a back-up HF communications centre, as other HF facilities in the Netherlands in Scheveningen and Ouddorp are dismantled because the lease on the land has expired and they are too close to built up areas. The site will be converted for its new purpose in the course of this year, 2013. My guess is that low power tests have been going on there for years. The powers needed to communicate with the Dutch navy and troops abroad will be a fraction of the 500kW pumped out from the masts for over two decades. And no doubt they will use spread spectrum digital communication systems rather than analogue. Note that the system is a back-up to current satellite systems, so it won't be needed every day. Interesting that this news still hasn't been placed on the website of the previous owners, the NOVEC. Is US International broadcasting defunct? I have a different interpretation from other commentators of what Hilary Clinton was saying this past week. I think she means that USIB hasn’t adapted to a more effective way of sharing America’s ideas and ideals with an important audience that is increasingly persuaded by America’s foes. If the Taliban had started a short-wave radio station, instead of using Youtube or selected TV stations, the world would be a lot safer today. The challenge facing international broadcasters is that audience habits are changing. 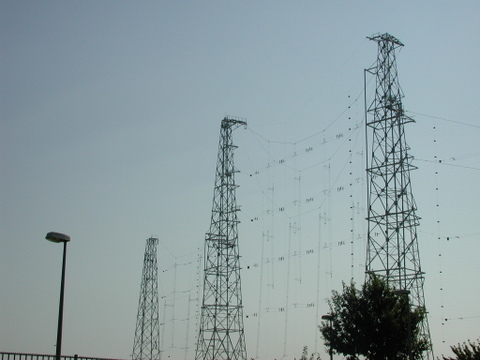 There are only around 8 countries in the world where shortwave broadcasting still makes economic sense as a way of sharing ideas with a significant audience. For the rest, and that includes China and Russia, the way to reach opinion formers has to be a hybrid mix of TV and web/mobile platforms. VOA and RFE/RL/RFA have a proud radio legacy with linear audio storytelling. But its now in a context that is not easy to share with others. USIB hasn’t found the format/platform combination that attracts significant audiences in these countries. So although its still easy to shout across the border, if the audience isn’t on that platform, audiences only spiral downward. The challenge is that many of these global broadcast systems were designed when oil was US$ 40 a barrel. The problem with international radio is that the audience research is only ever about numbers. I have never seen a discussion of how the audience trends could be used to make more effective, inclusive discussions in target countries. BBG meetings have always focussed on distribution arguments, with various stations justifying a new campaign or programme often by the number of reactions. I would use the word defunct. 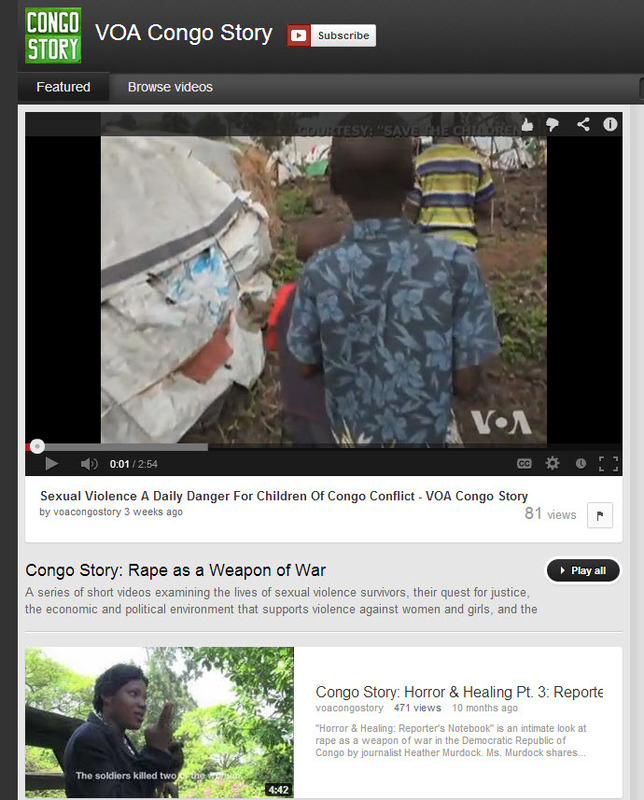 Various experiments have been tried by US international broadcasting with “new media”, like VOACongoStory. From the outside, they look to have failed to create a sustained discussion. 10 people ‘talking about it” on the Facebook, and a couple of hundred views for the majority of videos on the site. Yet, successes like Parazit are quietly forgotten when, for what ever reason, the creative team disbands. Parazit had 17 million visits a month in its heyday. But when new media experiments fail, the tendency is to resort to the analogue shortwave radio with the idea that this tried and tested medium has simply been neglected, understaffed or misunderstood. No. It’s gone away. It’s not coming back because no-one knows it is there – and the levels of interference from computers and light bulbs in most cities means the reception is awful. And people in radio (in general) don’t understand video storytelling. 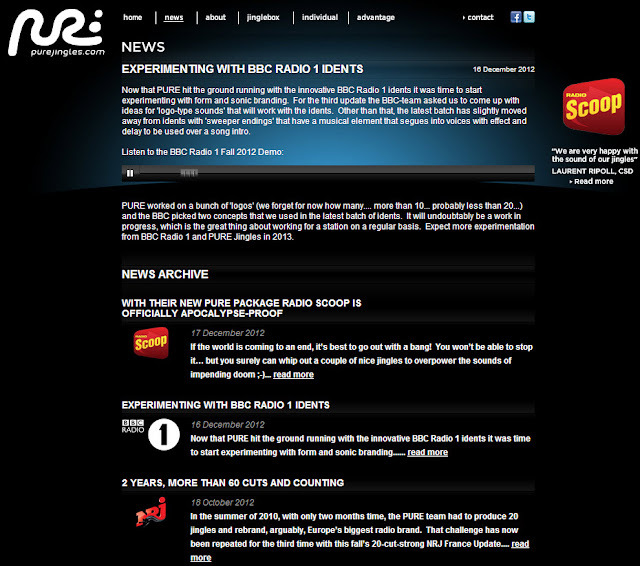 Commercial stations are set up to deliver audiences to advertisers. When the audience is far away and scattered that becomes an expensive proposition to prove they are really there. Commercial international radio worked until the early 1990′s (SLBC, Radio Luxembourg). But they’re history. Commercial international TV has always been a tiny niche. It’s cheap TV, talking heads for the most part. Thank goodness US taxpayers don’t have to fund it. But they are funding VOA, Radio Marti, RFE, RFA, Al Hurra, etc. No-one dares to do the calculation of what you could do with half the funding produced by one coherent, independent entity. Meantime, the atmosphere inside these organisations looks to be poisonous...The foes of America don't need to worry - USIB seems to be in self-destruct mode at the moment. America has some of the finest stories to share with the world. I find brilliant, worldclass stories on TED.com, FORA.TV, and some of the emerging YouTube and Vimeo channels. I enjoy the discussions I have with those who write, create or produce these productions. My problem with USIB is that they are still in the shouting business. And the audience they are trying to persuade ignores people who shout. Just had a reaction from friends about my comments today on the demise of Hilversum. 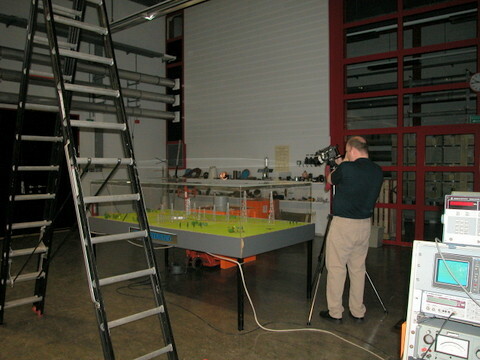 They pointed out that Hilversum does lead this part of Europe in the field of station imaging. A company tucked away in a villa, well away from the giant Media Park mind you, is quietly getting on with doing the music you hear on BBC Radio 1, as well as many commercial stations on the European continent. Seem to have overtaken some of the other leaders I used to know and trust. The company? Pure Jingles - part of the VHU group. The mayor of Hilversum, a former newspaper journalist, is fighting a losing battle to keep broadcasters getting the hell out of what's become a creative ghost town. The Media Park to the North of Hilversum was planned in an era when large studios were a symbol of success - and power was visible in the size of your office - the more windows, the greater your status. The problem is that the setting is not inspiring. Given the choice of canals or car-parks, concrete or cafes, Amsterdam wins hands down. The various production houses that make up Holland's chaotic public broadcasting system decided they needed to build their own studios - and did. In the 1990's and well into this new Millennium, the concrete was being poured at several sites. Those at the top believed that traditional broadcasters would drive the growth of the Internet, but had no clue (or interest) in other ways that production could be organised - other that building more studios. Now that consolidation has set in big time for the public broadcasters, the fusion of several broadcasters, is leading to an ever growing confusion. Broadcasters like the VARA and BNN feel the need to get out of their existing buildings and consolidate into another one. But where? They are threatening to move to Amsterdam. I would argue that since many of their studio based programmes already come from Amsterdam, they should simply go all the way. The better production companies, like Tuvalu, have already decided, and are off to be part of the media harbour near Central Station. In the case of the TROS and KRO, thie new home might be in the now nearly empty building of what was Radio Nederland Wereldomroep ( Dutch International broadcasting service). Another round of cuts have been announced, (100 million Euro) and the boss of the Netherlands Public Broadcasting corporation (NPO) has said most of the new savings will come off amusement and sports coverage. Bad news for the public broadcaster, the TROS, which has put its eggs into the amusement sector for years. The TROS has been one of the parties mentioned to move into the old Wereldomroep building, once asbestos has been removed (!). Will they really need all that space? I see that commercial radio station 100%NL, currently on the top floor of RNW, is shortly to exit too - heading off to Naarden. Is there anything creative left in Hilversum? VPRO does some original work on TV, especially in the field of science and documentaries. Voice of Holland is the major commercial success story. But why sit in Hilversum to do that? The commercial Telegraaf Media Group made a big splash a while back with social media (by acquiring Hyves.nl) and also backing a hyperlocal network called Dichtbij.nl (Nearby or Neighbourhood). This was accompanied by loud calls by the TMG for public broadcasting to get out of the news business because they were operating with an unfair advantage. TMG need to find new leaders. Because evidently, the current vision isn't working. Hyves has plummeted in popularity since being acquired by TMG, now being overtaken by the number of Twitter users in the Netherlands. Another classic example of a newspaper buying a social media network and thinking this is going to be a great advertising outlet. Better still, the users make the content, so no expense on writers and editors. I see that Sanoma Media is also getting rid of its public blogs site weblog.nl, giving it away to Wordpress. And then there is the hyperlocal network. What a disaster that is. It's simply a list of local crime, news of social collapse (neighbourhood arguments) and specialises in the aftermath of traffic accidents. We never see pictures of the victims. It's always shots of emergency services clearing up the mess. Because NONE of this is news you can use, it isn't a viable platform for social discussion. So no ads of any value because there's no traffic. My local community radio station is an automated juke box for much of the day. And so, frankly, if there was a major emergency in the area (floods on the way because melting snow?) how on earth would I find out? This programme features the start of WRMI from Miami Florida, a commercial station aimed at Cuba and run by entrepreneur Jeff White. 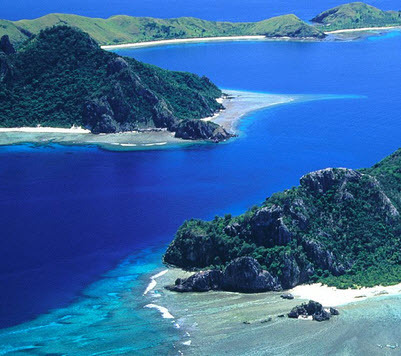 We also profile broadcasting in Fiji in the Pacific. For 20 years, I produced and presented a radio show about international broadcast media. I sent a copy of the programme to Austrian Radio, ORF in Vienna, as we shared resources with Wolf Harranth at Radio Austria International. When I left Radio Netherlands in 2003 (yes its 10 years), they sent all the old tapes back. I've uploaded quite a number of them back onto the web, simply for nostalgic listening and amusement. Amazed that these programmes get up to 6000 downloads a month. Not bad for steam radio. We had no idea that the people behind the station we reported on in this programme would later be responsible for a Sarin gas attack in Tokyo. But that was three years later. Spanish Foreign Radio is working on a relay station in Costa Rica. Radio Miami has done a deal with a station in Honduras. The Megaphone Newsreel marches across the continent. Radio Vilnius is worried about its relay in Moldova. Baltic Radio International is going to make money, so Paul Rusling claims. AWR Europe's World DX News signs off. Radio Norway plans special transmissions for Burma. Radio St Helena may return to the airwaves. Paul Ballster has found a new station in Wimbeldon. Radio Free Asia cancels a visit to Beijing. 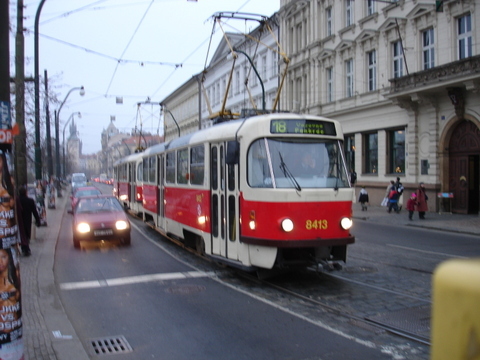 Radio Prague returns as the country of Czechoslovakia ceases to exist. Jim Cutler goes mad about our phone number. Radio Sweden changes its output. Changes are afoot at Radio Luxembourg, with the ending of English broadcasts. Wolfgang Schultz reports from Hamburg. Radio Monique is revived on Euronet via SkySports. Euronews is launched from Lyon. Dutch public broadcasters scorn the channel. We remember LM Radio out of Mozambique. Victor Goonetilleke remembers hearing it. Moldova is testing, as so is Radio Australia. MN.15.03.1990. Incremental Radio - What would life be without it? A news edition of the Media Network programme. This programme kicks off with a super-fast Morse test. The Goddess of Democracy ship leaves France for the coast of China and Lithuania proclaims its regained independence. Ironically, the broadcast came via transmitters in Russia. Richard Ginbey sends in news about Radio Namibia where he was working. 2MInternational launches, as the first private TV channel in North Africa. Thieves break into HCJB's transmitter site in Pifo and steal equipment. Venzuealan National Radio plans programmes in other languages. Radio Nacional de Venezuela also has plans for expansion. 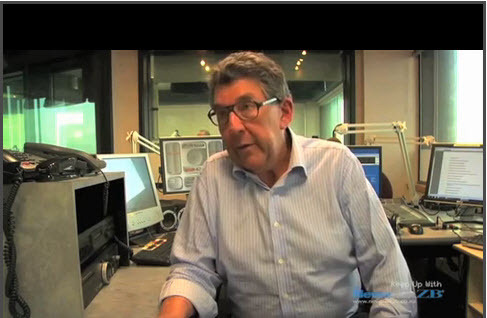 Julian Clover (now editor of Broadband TV News) compiled an item on Incremental Radio. Radio Romania International is the new name for Radio Bucharest. New programmes are being broadcast from Southern Iran beamed into South Asia. Big ionospheric storms hit shortwave reception. This video documentary is still on my list of things to do. I may have to retitle it - In Search of Radio's Glorious Past... but still. It's the story of how radio went digital - often in unexpected ways. 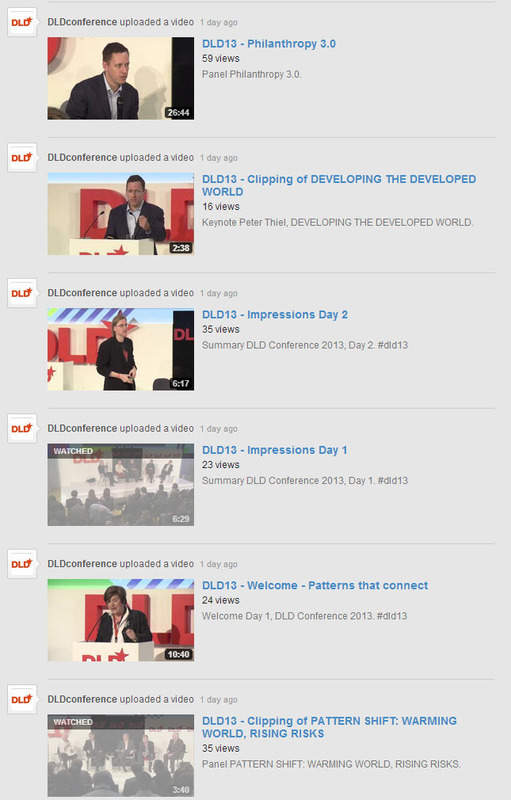 DLD, an invite only media conference at the Munich headquarters of Burda Media is always a mixed bag. This year there were some interesting talks about search and hosting. And some rather blatant commercials for a rather uninspiring solar lantern called Luci. (in my view, barefootpower.com is way ahead in that field). But some things are always the same at DLD. The agenda is only released about 24 hours before it starts. And I get the impression the video editors don't really understand what the speakers are talking about. They try to make highlights of the session, rather like covering the goals in a football match. Doesn't work, does it? They don't write much context around the videos, so unless you watched it live, you'll never find it again. Pity. 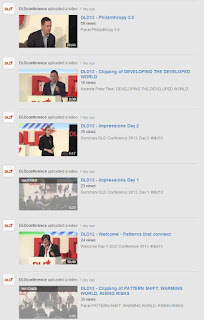 Navigation on the DLD Youtube channel is a nightmare. Different videos from different years get all mixed up. And clearly that means most of the videos are only seen by the happy few. I note that Al Jazeera is starting its Turkish network later this year. (last line of the press release). And this is about the only page where Hilary Clinton and John McCain can agree on one thing. 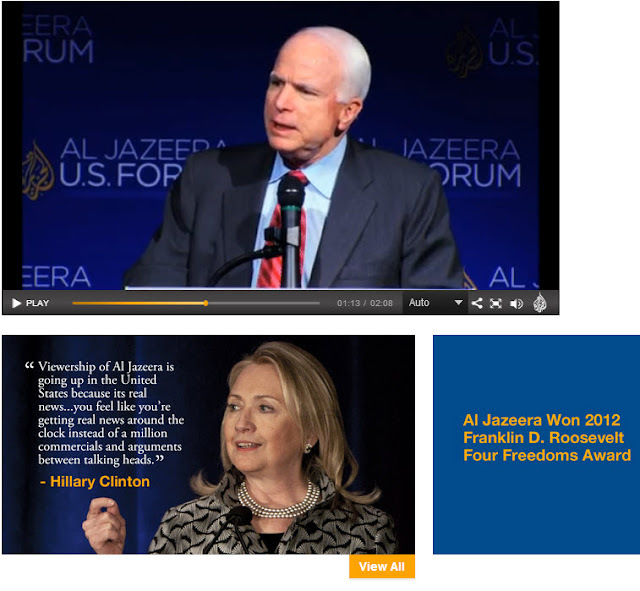 How great Al Jazeera is of course. Watched the grand relaunch of BBC World News over the past week. 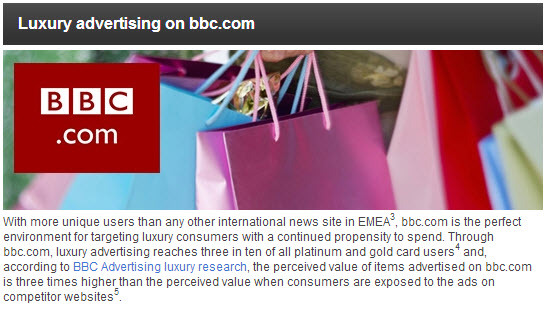 It's fascinating, especially on the special site that is targeted to potential BBC partners, i.e. 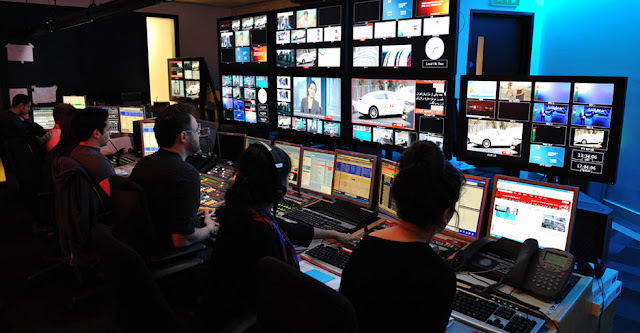 TV stations/networks that would like to use the output from London on their station. They're boasting about their fancy new technology at the top of London's Regent Street, home to 6000 staff who man what is claimed to be the world's largest newsroom. You can only play their promo videos on the site itself - no embedding for you, unlike the competition from Al Jazeera, RT, or France 24. All this, we're told means a "new era of news broadcasting". Its looks slicker, that's true. Bit early to say whether the journalism is any better. But with copy like that, you have to start comparing. And yet there are striking similarities to the new BBC newsroom with other stations. It looks to me like the new BBC newsroom was built by crossing the colour scheme of Al Jazeera English with the technology that you find in Al Arabiya in Dubai. Except that the production teams in London seem to be much larger. 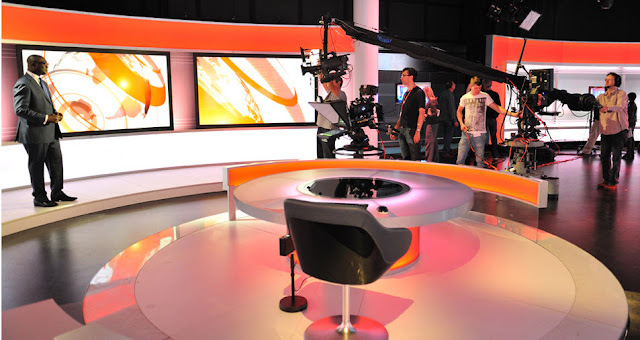 BBC Persian TV Gallery (BBC Publicity Photo). Here's the clue to why there is something familiar about all these places. There are only a few people designing newsrooms in the world. 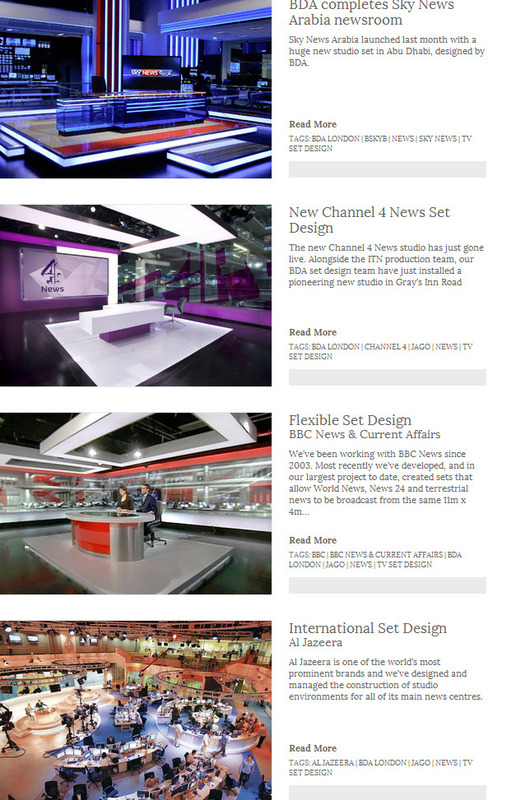 And BDA Creative has photos of all these stations as clients on its website. Blue, red and purple seem to be vogue colours everywhere. I'm still amazed about all these production people in the studios. Were they there because BBC Publicity were taking photos? Quite a crowd for a news studio. What's my point? For me, the BBC is at its best when it is humble, just getting on with bringing in the best reports from around the world. It's someone like Lyse Doucet explaining a complex situation is a clear way. It's not about claiming "exclusives". Perhaps, because they have been the poor cousin when it comes to facilities for so long, the BBC need the chance to bang the gong a bit. But that backfired on Al Jazeera English in the past. Their promos were so slick at launch that other stations said they were so different in style from what they were putting out locally, that there was no way to integrate AJ programmes into their networks. The BBC partner site is curious because its aimed at both broadcast partners and advertisers, all rolled into one. That's strange because the sell to distributors is usually rather different. The copy on the home page is for potential advertisers on the BBC Network, not those stations or networks that might be interested in carrying them. 1) Sound Mixer. Balances microphones, VT packages, incoming satellite links, etc, as well as routes audio around the studio and arranges live translations as required. 2) Technical Co-Ordinator. Balances the cameras, robotically controls some cameras (to keep the number of camera operators down), deals with studio lighting, routes incoming and outgoing feeds including satellite links, and is the first point of contact for any technical requests. 3) Vision Mixer. Cuts the pictures you see on-screen. 4) Director. Liaises with the Output Editor (see below), plays packages, calculates timings and ensures the smooth-running of the programme from a technical point of view. 5) Output Editor (aka Producer). Speaks Farsi and is editorially in control of the programme, liaises with the Director to ensure the technical team do as required. Checks all material before it goes to air to ensure compliance. Writes suggested scripts and cues for the presenter. 6) Text Outputter. Speaks Farsi and is in control of all text on-screen, from the ticker at the bottom, to name captions in packages, and locations for live contributions. Updates and activates these text elements as packages play and as stories develop. 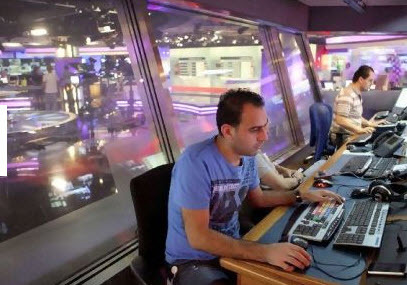 The photo of the AlArabiya gallery looks, to me, as if the two people in the photograph are more editorial people, rather than technical people. In other words, they are the equivalent of the Output Editor and Text Outputter in the BBC galleries, and their colleagues doing the technical work are not actually shown in this photo. Thanks Stuart. If the studio is working in a language other than English, then that does explain why there are more people in the gallery than I expected. And I have a huge respect for what they are doing in bringing important news to Iran. Hopefully, with changes at the top in Tehran, there will less jamming of the BBC Signal. Iron Man 3 or Gandhi 2? Where on earth is media going in 2013?